Seven more days until the sign ups for the new Quilt U Be Mine Mystery Round Robin closes. Hurry up and add your name to the list so that you don't miss out on all the fun! In order to give you a better idea of how this will work, my friend Bea did up this series of samples in EQ for me (thank you so very much Bea) to demonstrate what the possibilities could be (but you are in no way restricted to these ideas). 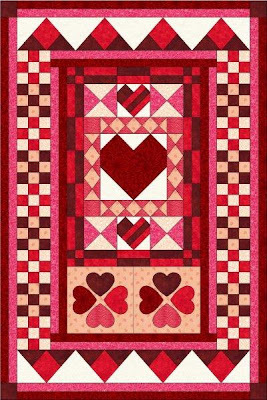 This is only to give you ideas of what a quilt could look like with borders added to 1, 2 or all 4 sides for any one border addition. 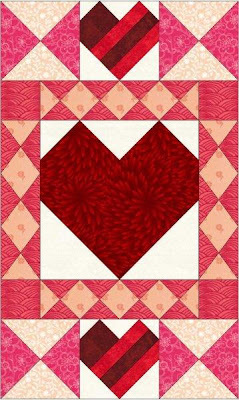 Quinlee Quilter #1 started with a Red Heart on a white background 8 1/2" unfinished block. It was then mailed onto Groupie #2. Once in her hot little hands Groupie #2 added the 2" finished Diamond border on all 4 sides. 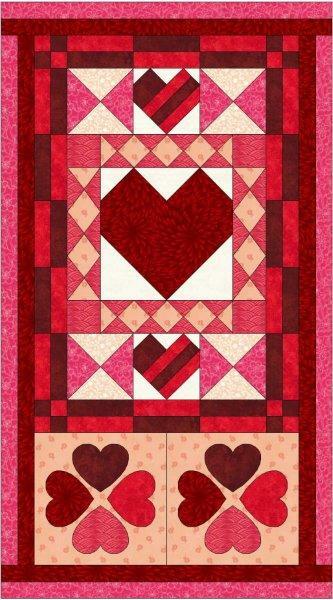 Next she added the Hourglass and Heart 4" finished border to 2 sides only and then mailed it onto Player #3. Once Player #3 had it, she decides on the 2" finished Bar with 4 Patch corners border to all 4 sides as her 1st addition. 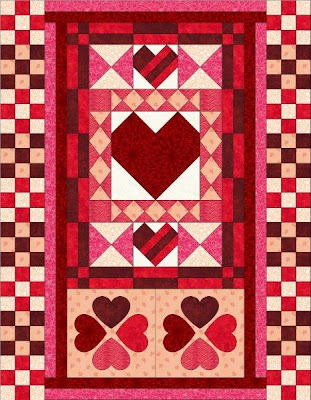 And for her 2nd addition, Player #3 adds the 8" finished Hearts Clover border to 1 side only. Then it is mailed on to Compadre #4. When this mini quilt-in-progress arrives on Compadre #4's doorstep, she chooses to add the Double Simple Pink and Red 2" finished border to all 4 sides. 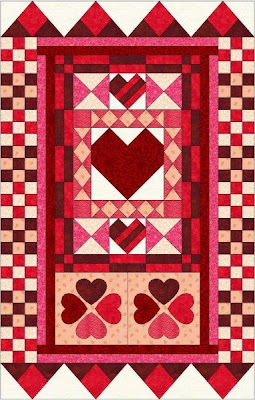 But since she gets to add not 1 but 2 borders to this piece, she elects to add the 4" finished 9 Patch border to 2 sides only. 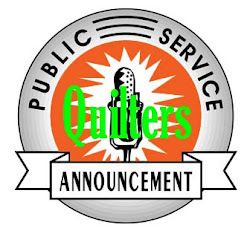 Then she mails the entire piece back home to Quinlee Quilter #1. 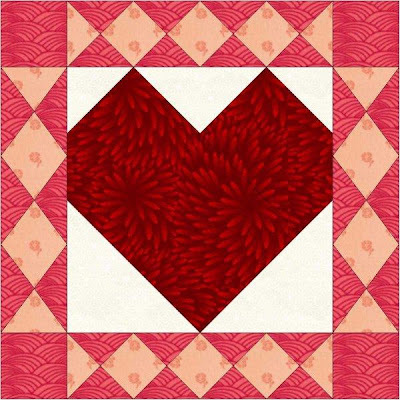 When Quinlee Quilter #1 sees all the great borders added so far to her center, she is elated and contemplates very carefully how to finish off her piece. 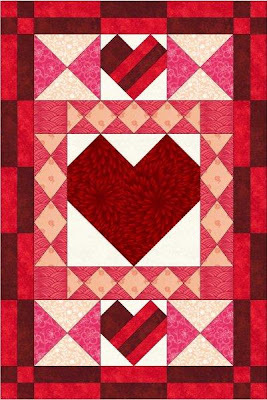 Although an actual finish isn't required for the big reveal/linky party on Valentine's Day, she wants to display her beautiful quilt for all her loved ones to see and admire. 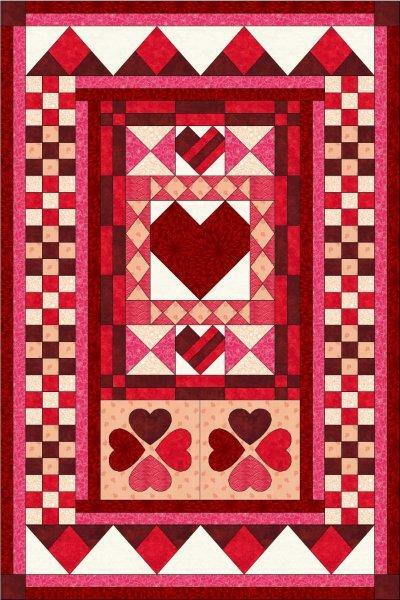 So first she added a variation Flying Geese 4" border on 2 sides. And lastly she added a Simple Double border to finish the top. Once quilted and bound, she proudly hangs this sweet quilt in her living room so that everyone can see just how wonderful her Round Robin buddies worked together to help her create this masterpiece. Congratulations to all these story participants for a job well done. 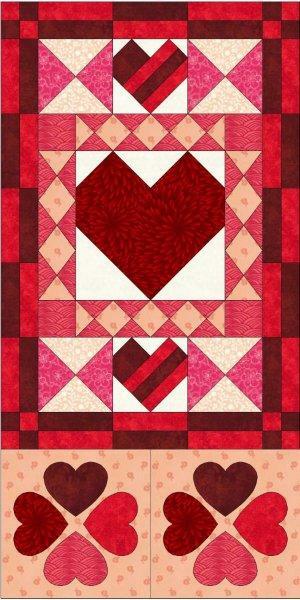 So there you have it, an example of a terrific quilt that could be yours at the end of this Round Robin. So what sort of center block will you create? Sign up and send me your details today! Love the idea! I like how it ended up rectangular and not square. Opened my eyes to some new ideas. Now to get cracking on my mini! That was the idea Lisa....giving everyone some new ideas and different things to try. Wow so much fun. I really want in on this. I just have a lot of machine quilting going on/--- two baby quilts for coworkers that are due before October is over. 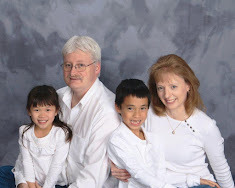 If I can get them done this week, I will send you an email to sign up before the deadline. Didn't you know Rachell that I had already put you on the list? That's what I'm talking about! Options! Constructions wider than 2". I'm in. It was your suggestion Ann so I just added in alternatives. This one should be a lot more interesting. I'm already in and I have my thinking cap on! Don’t look to me for this one. I don’t do curves! 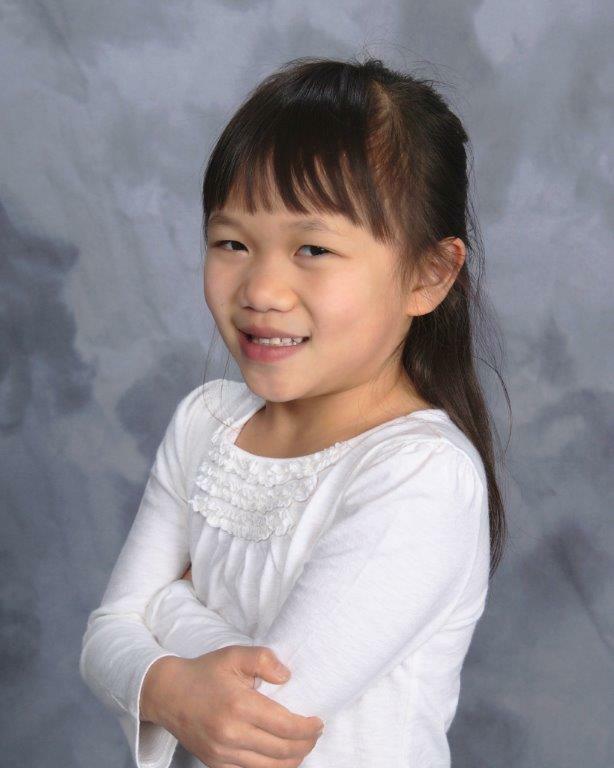 That Bea rocks, doesn't she? I'm debating hard and heavy about this one! This would be so much fun to play with! I'm going back to see all the rules again! Oh, please please join in. It won’t be the same without you!